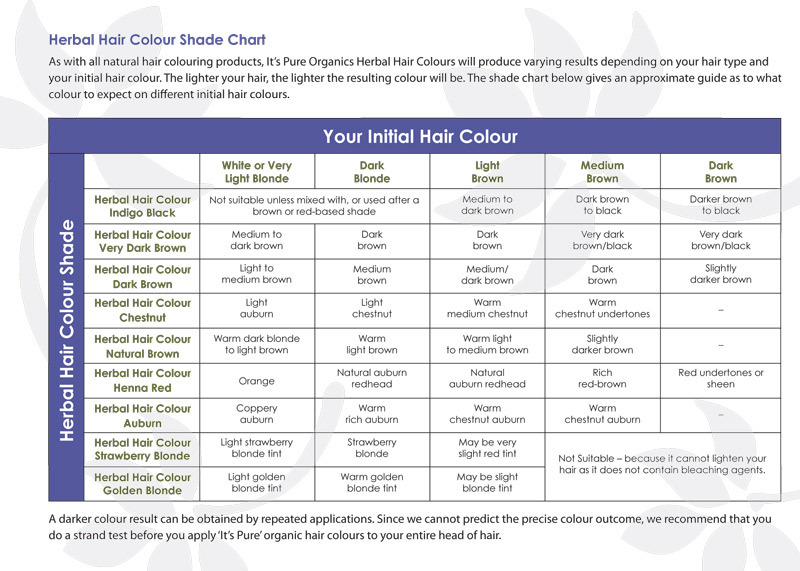 It's Pure Organics are the only Herbal Hair Colours in the world that are Certified Organic by the Soil Association. They contain no p-phenylenediamine (PPD), ammonia, peroxide, parabens, resorcinol, propylene glycol or any other chemicals. They are safe if you have an allergy to PPD in conventional hair dyes. They don't damage your hair but coat your hair with a film of colour. They condition your hair and increase volume and shine. This Chestnut colour is suitable for colouring blonde to light brown hair and grey hair. It is lighter and warmer than the Its Pure Dark Brown. Suitable for colouring light to dark blonde hair, or grey hair. Henna Red shade is suitable for colouring medium blonde to medium brown hair. Suitable for colouring blonde to medium brown hair, or grey hair. Suitable for blondes who want to enhance their natural hair colour with a beautiful Strawberry Blonde tint, or cover grey hair. This is a small sachet sample of the dye, for the purpose of strand testing on hair and patch testing on skin. It comes with full instructions.